Kelly’s experience will be key as eOriginal focuses on business development activities and strategic partnerships in new markets and continues to experience hyper growth in the digital transaction management (DTM) industry. 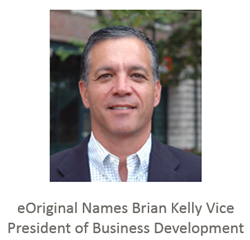 eOriginal, Inc., the experts in digital transactions, is pleased to announce that Brian Kelly has been appointed vice president of business development. Kelly’s experience will be key as eOriginal focuses on business development activities and strategic partnerships in new markets and continues to experience hyper growth in the digital transaction management (DTM) industry. To support the expansion, Kelly’s experience leading business development, sales and marketing teams for growth stage technology companies will help drive eOriginal towards what leadership predicts will be an even greater year-over-year growth in 2016. To learn more about eOriginal’s leadership team, click here. eOriginal’s progression is due to businesses striving to make financial transactions more efficient to improve margins. While DTM is in the early adoption phase of the technology lifecycle curve, the early adopters that have made the move to go digital are promoting its benefits to peers. Over his career, Kelly has held the role of Vice President of Sales and Marketing at both Mobile System 7, an enterprise security company, and KZO Innovations, an enterprise video application provider. He has also held senior leadership positions in business development and sales at VeriSign and J.P. Morgan Chase. Kelly holds a MBA in Finance from New York University’s Stern School of Business and a Bachelor’s of Science in Finance from Pennsylvania State University. Through its eAsset® Management platform, eOriginal provides the maintenance, control and use of critical documents that have an intrinsic value, such as loan and lease agreements. It stores and protects these assets in a fully electronic environment throughout their entire lifecycle, including post-signature execution that ultimately results in collateralization, securitization or pledging in the secondary markets. By maintaining the authenticity of original documents, the identity of the signatories and the integrity of the content, eOriginal enables customers to realize the true benefits of fully electronic transactions and the resulting business-process improvements. As a result, lenders can respond quickly to auditors and regulators with a new level of transparency, in real time and across various document types over the entire chain of custody. Founded in 1996, eOriginal is the trusted expert in digital transaction management solutions, specializing in the post-execution management of financial asset documentation. eOriginal SmartSign® and eAsset® Management Services enable an end-to-end solution for fully electronic transactions that must be managed with the highest levels of security and compliance throughout their lifecycle. By treating every transaction as having assets that must be verifiably secure, legally compliant and enforceable, eOriginal provides its customers and partners with eCertainty®. For more information, please visit http://www.eoriginal.com. eOriginal®, eAsset®, eOriginal SmartSign® and eCertainty® are trademarks of eOriginal, Inc. and are registered in the United States or in other jurisdictions.